Purple Wildflower at the side of the road. They’re exploding in blooms all over the place around here. Not sure what they are but I like them. They’re thriving on the shoulders of country roads and city roads alike. 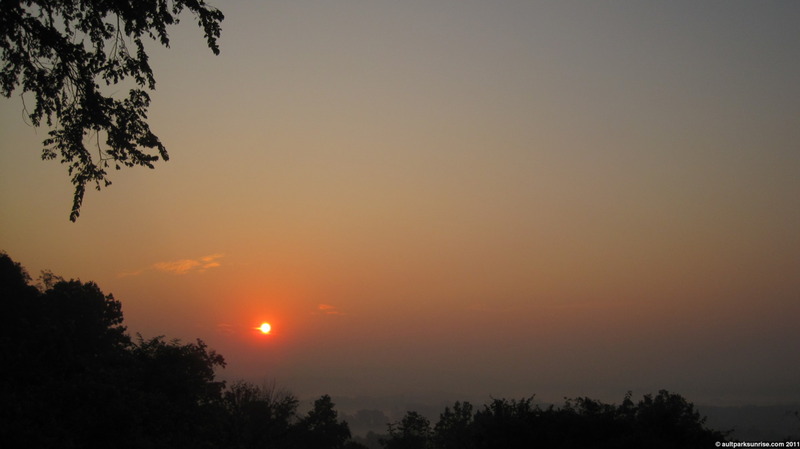 The late sunrise this morning over the haze. 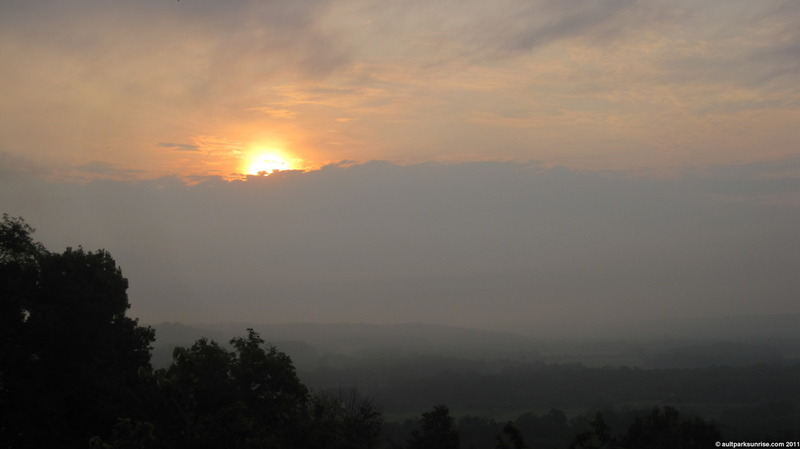 This morning’s post has twice the sunrise packed into a single entry! On Friday I forgot to grab the USB cable that connects the camera to my laptop when I hopped in the car so I wasn’t able to make the Sunrise 69 post in a timely manner. Therefor today’s post has both this morning’s sunrise and Friday’s sunrise. I kind of like having both of them together because it keeps the volume of daily posts to a lower level. I don’t always like the fact that the front page is completely turned over very 10 days and often wonder if maybe my posting frequency is too high. The reason I wonder is that I’ll have a 35 picture historical exploration that gets bumped off with daily 3-picture sunrise posts. Oh well, that’s what the terribly outdated best-of section is for I suppose. 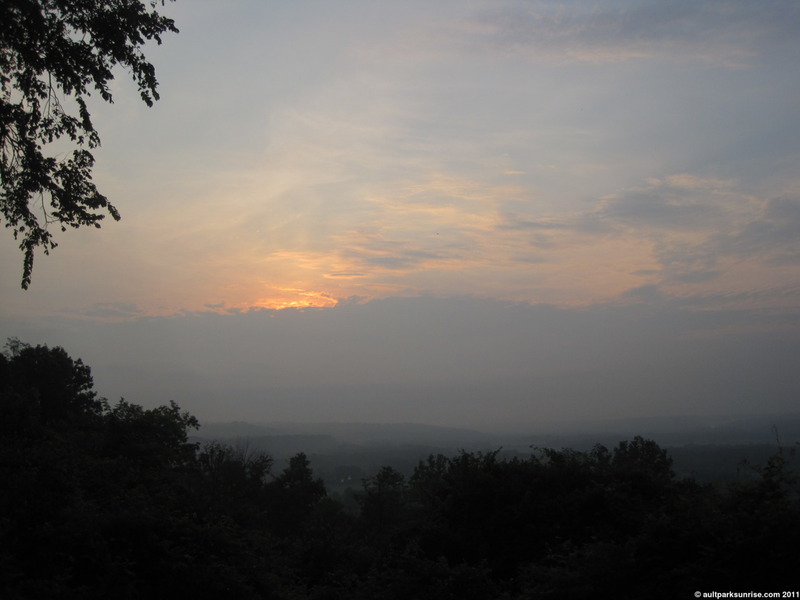 Both of the past two sunrises have been full of haze. We had some serious storms roll through the area over the weekend (after this picture was taken last Friday). While the temperature is lower, the humidity is still high down in the valley. 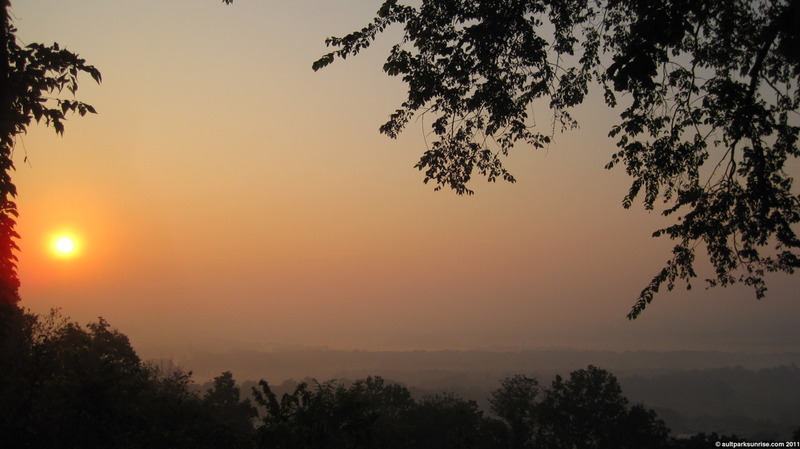 The low haze on the floor of the valley has caused the sun light to maintain a deep orange color late into the sunrise. 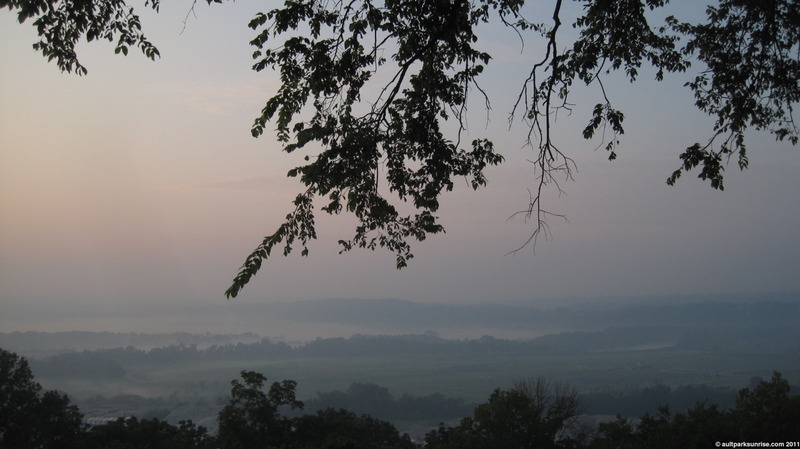 Looking out at Sunrise 69 from the overlook. The ridge line disappears off to the east into the foggy air. This morning was a bit more gray than Friday. 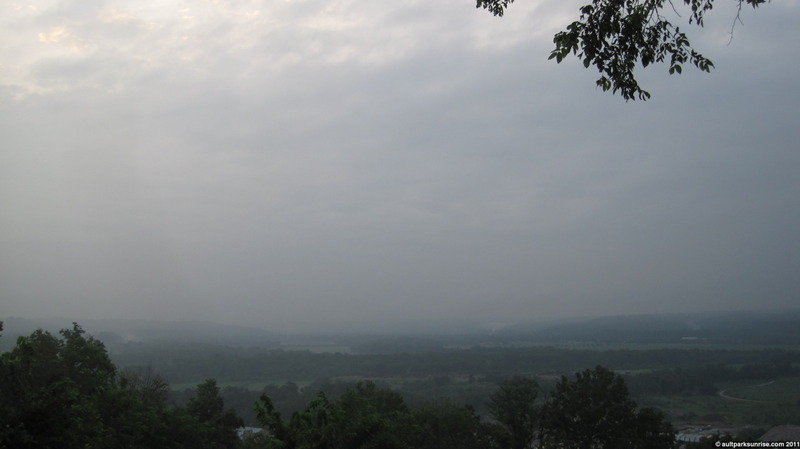 I think it is interesting to note that there is a huge “fog”, or cloud, layer high in the sky. After big storms come through it seems that the fog layer gets raised high into the sky. We only experienced the edge of the storm front down here (Columbus, Ohio – 100 miles north – got slammed last night. We got caught in it while traveling home). Our atmosphere is still cloudy and unsettled. You can get an idea of how dark the valley was against the bright upper atmosphere. 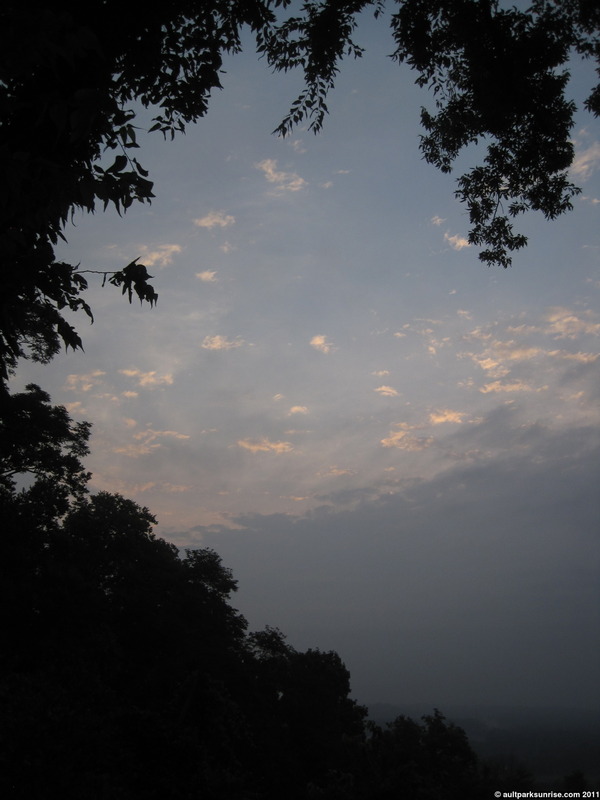 The high altitude clouds were starting to see some light about 15 minutes after sunrise. About 45 minutes after sunrise time (I actually got to the park 20 minutes later, oops!) the sun was finally starting to light up the sky. 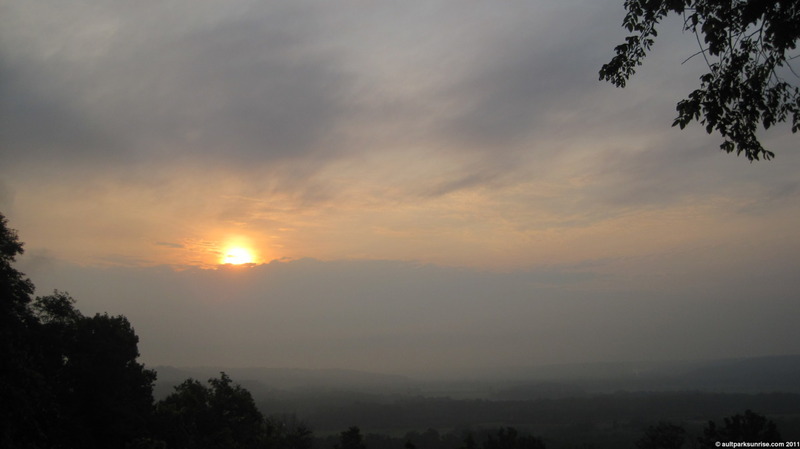 The sun crests over the haze layer. On the way home I stopped to take a picture of this purple wildflower. All over Cincinnati I have seen this purple flower and Queen Anne’s Lace growing high in the grassy shoulders. I think the flower is really pretty. 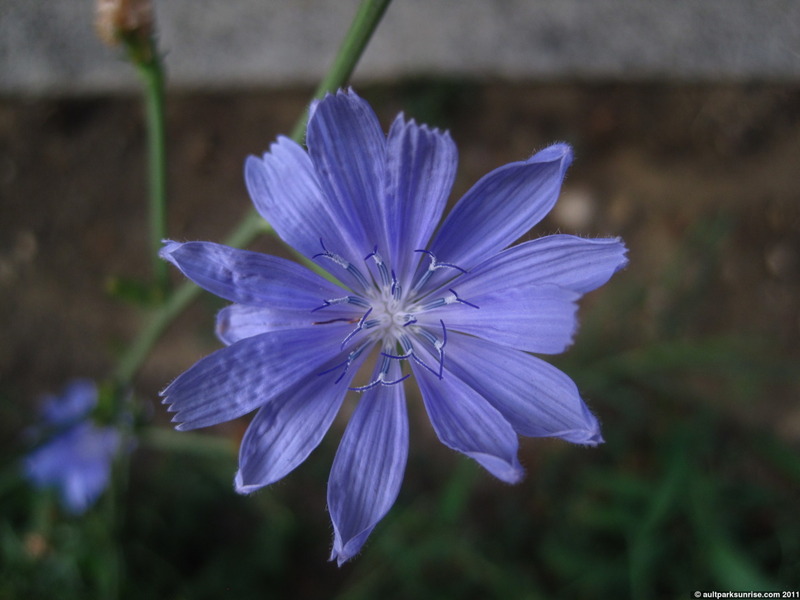 There are several blooms to the plant, and the plant itself is very hardy and looks tough. I’m not sure what species it is and I haven’t been able to track it down. Later this week, if the sun comes up out early enough, I’ll try to find a big patch of these beautiful midwest wildflowers. I imagine Armleder Park is full of them. 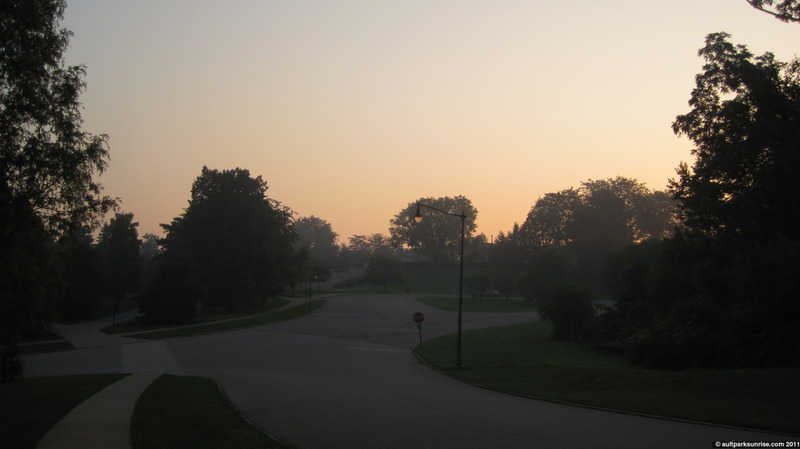 This entry was posted on July 25, 2011 by Ault Park Sunrise. It was filed under ault park, macro, sunrise, thick haze and was tagged with ault park, cincinnati, flowers, foggy, macro, sunrise. 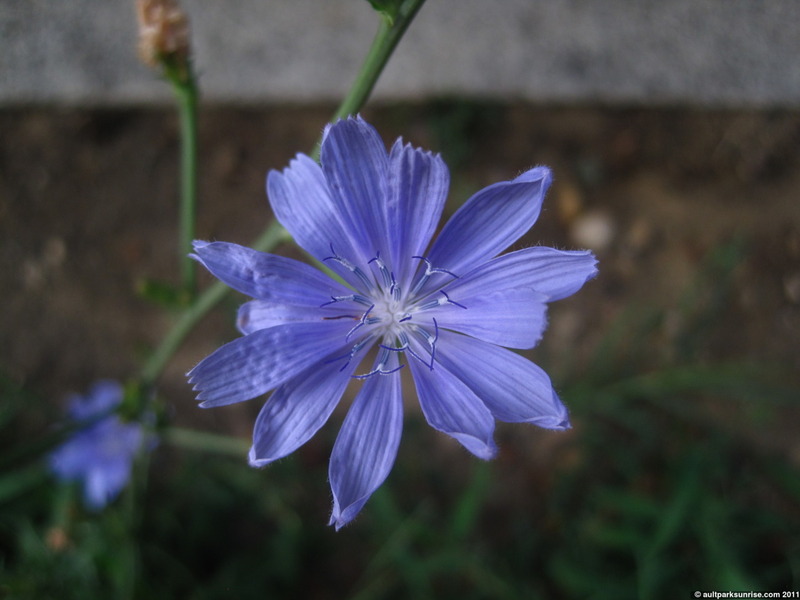 It looks like chickory. It opens in the morning and closes with the late morning early afternoon sun.